Terise over at Breeches and Boat Shoes posted this last week, and I thought it was a great idea so I stole it. Yay, thievery. But really, it’s a good one so it should be a blog hop. 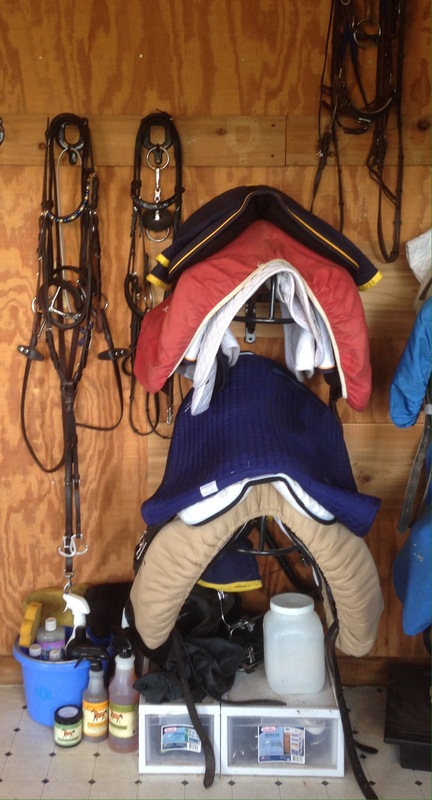 I have two different trunks (barn trunk and trailer trunk) plus a mess of stuff in the tack room, so brace yourselves. I didn’t even bother trying to document the piles of random crap currently residing in my garage or guest room. I pretend those aren’t there, especially when SO inquires about them. First- Stanley. I love Stanley. 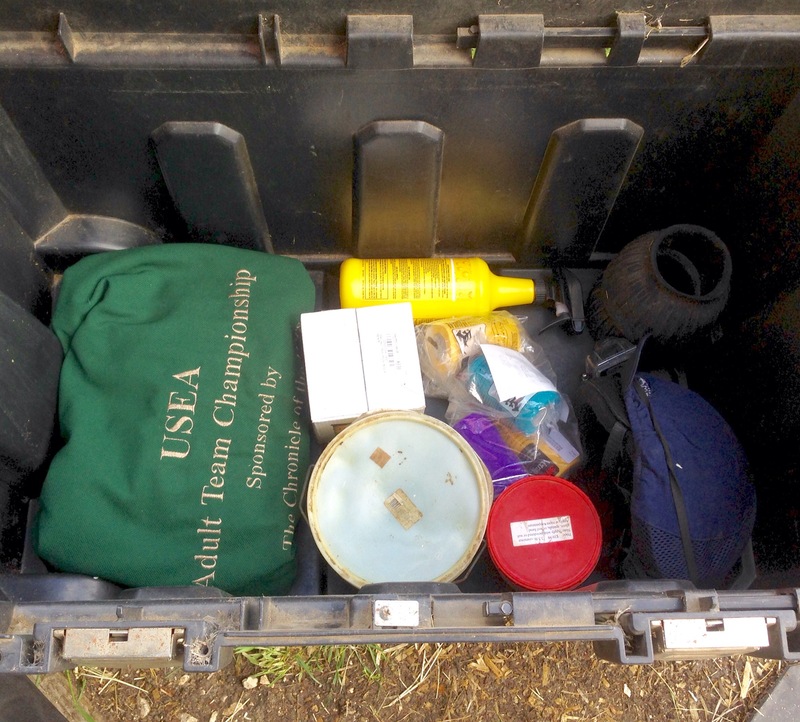 The bottom layer has a cooler, a tub of Effol hoof conditioner that I’ve had for approximately 9,000 years, hoof pack, vet wrap, a spare Himalayan salt block, my skull cap, extra fly spray, and extra bell boots. The next layer is the Back on Track stuff (mesh sheet and quick wraps), the current almost empty can of fly spray, my jumping boots, my black set of Majyk Equipe XC boots, and my navy DSBs. 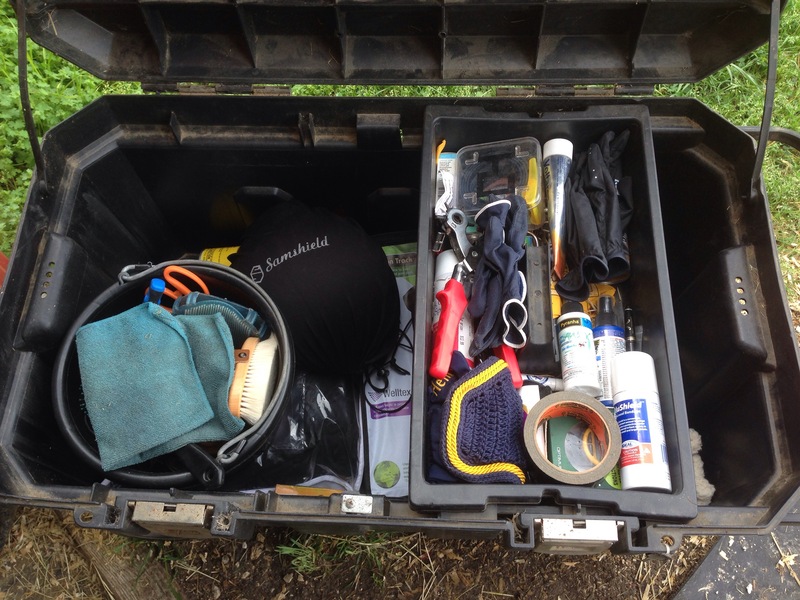 Then on top is my grooming bucket, my Samshield, and my tray of random crap (including but not limited to: fly bonnet, XC watch, various wound sprays and ointments, tape, a leather punch, a belt, two pairs of gloves, a weight tape, Voltaren, and sticky spray). It’s small and super lightweight, so it’s easy to lift in and out of the trailer. This one mostly has stuff that I only use at shows. It serves the dual purpose of storing things that don’t really need taking up space in my other trunk, and having some stuff already “pre-packed” when I go places. Laziness is key. The bottom layer is poultice, some Omeprazole, a lunge line, my saddle and bridle racks, poultice papers, Henry’s sleazy hood, my XC whip, and a spare halter. The next layer is Stud Muffins (horse show necessity), white set of Majyk Equipe XC boots, braiding kit, a bag of random little stuff (currently it has a couple of snaps, a sharpie, extra bridle tag numbers, safety pins, chapstick, a couple band-aids, and a copy of Henry’s coggins & vax record), my pinney, and my Signature Spurs. 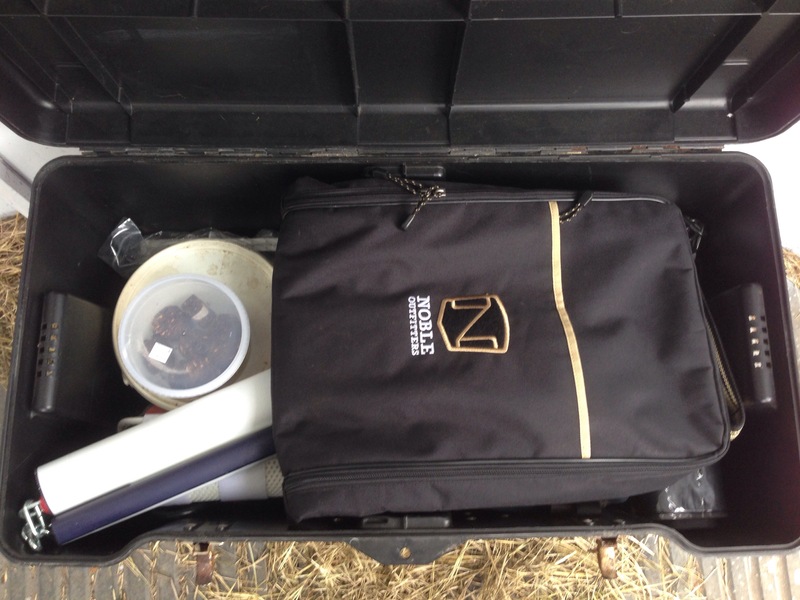 On top of that goes my Deco Pony stall guard and my Noble Outfitters bridle bag, at which point the tiny trunk is at max capacity. Three bridles, two saddles (with girth, corresponding Ogilvy pad, and current-rotation schooling pad on top), all of my extra saddle pads, some extra bits, my bathing stuff, my GPA (because I dunno, I just can’t throw it away yet), and two little Rubbermaid drawers. One drawer has all of Henry’s bonnets in it (there might be 8 of them) and the other has more spare bits, syringes, and tack cleaning stuff. This is what my blog post is gonna look like … lots of stuff in lots of places. You left out, ‘a tissue with Halo’s nasal discharge’. That was already relocated to your trunk at the time these photos were taken. Asshat. No, they’re in your gloves. You’re as dumb as you’re stinky. OR ARE THEYYYY???? PS I’m glad I got you birthday card as horrible as you are. They are, so is the tissue with the questionable substance in it. You’re just as disgusting as your horse. Clearly, look at my friends (you). I felt sorry for you. Pity friendship. Wait, that’s what mine is for you?! well, now this is awkward. Love your little baggie/pouch in the little tack trunk. Bwahaha, I need one like that so I can make it extra clear to people to not mess with my stuff. Maybe this hop will be the push I need to tidy my trunk post-winter-crap-accumulation. That’s what it was for me! I actually semi-cleaned my trunk. And by that I mean scraped out all the hay and dirt from the bottom. I wish I was this organized!! I’m always scrambling before shows..haha! This just reminds me of all the junk I have. In my trunk, near my trunk, in my horse trailer, in the hay shed, in my garage and in my shed at home. Ugh. I don’t really know if I want to play this game. 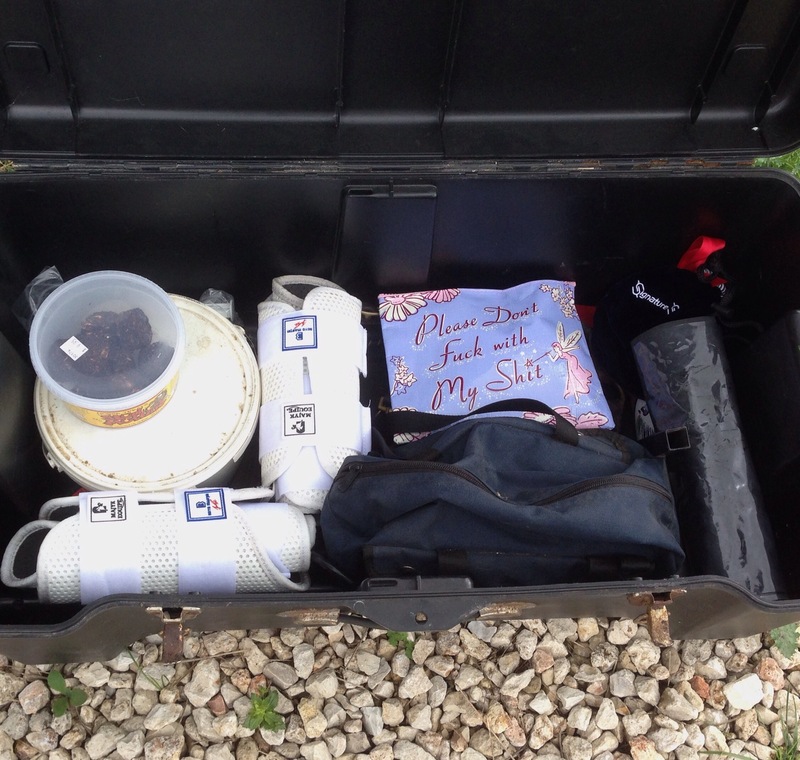 I was astounded at how clean and little was in your trunk…and then I saw your stuff by your tack. I’m jealous. I’m really paranoid about stuff spilling in my trunk so I try to keep the majority of my liquids separate. Because I’m weird.